I am always amazed at the quality of many blogs on the internet. But sometimes I wish I could curl up to the fire to read them without finding a convenient plug for my laptop. Leatherbound Book Works now offers a solution: a physical representation of your blog, printed in color and bound in leather. Whether you desire a modern smooth spine binding or something more traditional, we can take your blog and transform it into a heirloom quality book that might even get your most Luddite friend to ask for your URL. Leatherbound Blogs are fast becoming one of our most popular products. 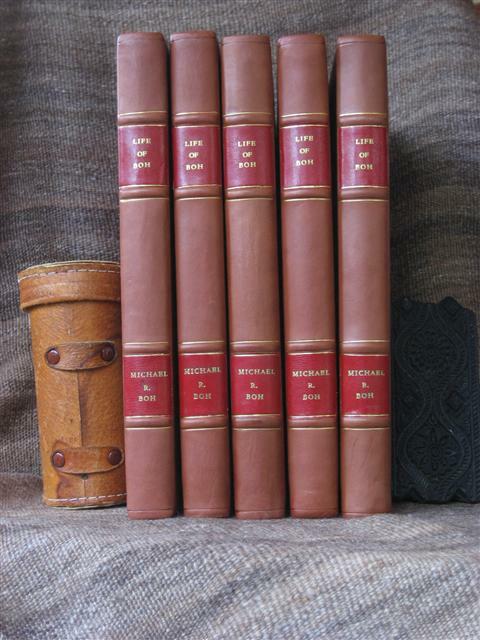 This is our first blog project, five copies of Michael Boh's The Life of Boh in calf with red labels and gold tooling on the spine. The entire text was printed in color.